The Universal Transverse Mercator coordinate system is a global system of grid-based mapping references. 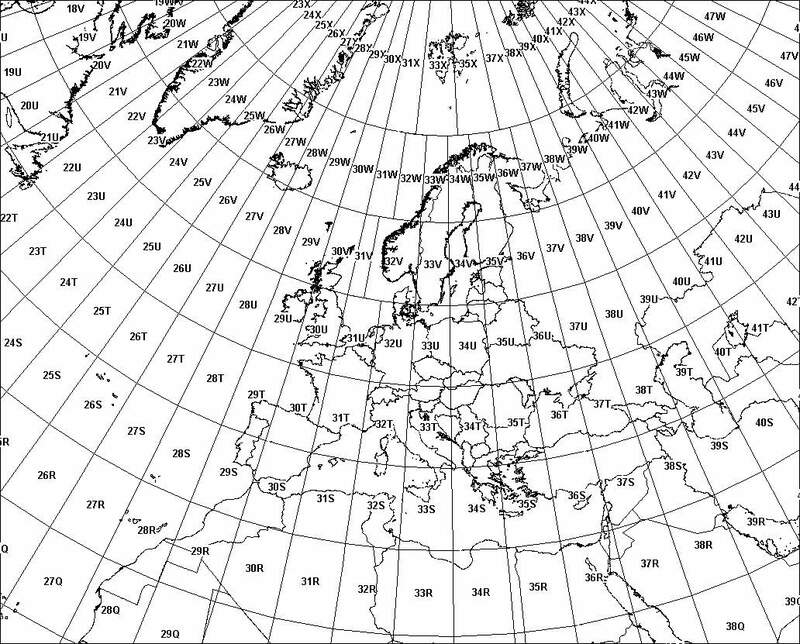 UTM is in fact a set of 60 separate ‘transverse Mercator’ projections,1 covering 60 latitudinal zones each 6° wide. It covers latitudes spanning 80°S to 84°N (the poles are covered by the separate ‘UPS’ system). Latitude/longitude points are converted to eastings and northings measured in metres along (an ellipsoidal model of) the earth’s surface. Eastings are measured from 500,000 metres west of the central meridian. Eastings (at the equator) range from 166,021m to 833,978m (the range decreases moving away from the equator); a point on the the central meridian has the value 500,000m. In the northern hemisphere, northings are measured from the equator – ranging from 0 at the equator to 9,329,005m at 84°N). In the southern hemisphere they are measured from 10,000,000 metres south of the equator (close to the pole) – ranging from 1,116,915m at 80°S to 10,000,000m at the equator. Geokov has a good explanation. Norway/Svalbard: the designers of UTM made two exceptions to the rule. The part of zone 31 covering western Norway is transferred to zone 32, and the zones covering Svalbard are tweaked to keep Svalbard in two zones (it’s easier to understand looking at a map). These widened zones are viable partly because zones are much narrower so far north, so little precision is lost in merging them. Note that UTM coordinates get rounded, not truncated (unlike MGRS grid references). The Military Grid Reference System is an alternative way of representing UTM coordinates. Instead of having monotonic eastings for a zone, and northings measured to/from the equator, zones are divided into latitude bands, then into 100km grid squares identified by letter-pairs, then eastings and northings within each 100km grid square. Each ‘GZD’ is divided into 100km squares, identified by a letter-pair (see illustration). Eastings and northings are then given in metres within each 100km square. Hence the UTM coordinate 31 N 303760 5787415 is equivalent to an MGRS grid reference of 31U CT 03760 87415. Depending on the map scale or scope of interest the GZD, and even the 100km square identification, may be dropped. Similarly, depending on the accuracy required, the easting and northing may be given to 10 digits (specifying metres), to 8 digits, to 6 digits, or to just 4 digits (specifying kilometre squares). Since UTM coordinates have to indicate which hemisphere they are in, it is important not to confuse the hemisphere indicator with a UTM ‘latitude band’ (since latitude bands also include ‘N’ and ‘S’). In these scripts, UTM coordinates have a space between the zone and the hemisphere indicator, and no 100km square indicator. Note that MGRS grid references get truncated, not rounded (unlike UTM coordinates). These scripts to calculate UTM eastings/northings from geodetic latitude/longitude and vice-versa implement Karney’s method, which (in the order n6 version used) gives results “accurate to 5 nm for distances up to 3,900 km from the central meridian” (improving on more familiar earlier methods from Snyder/Thomas/USDMA). Such accuracy is laudable, but does open further issues. The now-ubiquitous geocentric global datum WGS-84 (World Geodetic System 1984) has no ‘physical realisation’ – it is not tied to geodetic groundstations, just to satellites – and is defined to be accurate to no better than around ±1 metre (good enough for most of us!). A central problem is that at an accuracy of better than ±1 metre, plate tectonic movements become significant. Simplifying somewhat (well, actually, a lot! ), the ITRS was developed, with ‘epoch’-dependant ITRFs, where the latitude/longitude coordinate of a position will vary over time. Various ‘static’ reference frames are also defined for various continents – NAD-83 for North America, ETRS89 for Europe, GDA94 for Australia, etc – within which latitude/longitude coordinates remain fixed (at least to centimetre or so accuracy, major earthquake events excepted). These reference frames have ‘epoch’-dependant mappings to ITRF datums. (Due to plate tectonics, ETRS89 shifts against ITRF by about 25mm/year; GDA94 by around 80mm/year). So if you are using the calculations given here to convert between geodetic latitude/longitude coordinates and UTM grid references, you can assure your users they have no accuracy concerns – but you may have a major task explaining datums and reference frames to them. Remarkably, this accuracy comes in a very simple & concise implementation; having entirely failed even to begin to understand the mathematics, I find it a source of wonder that such an involved derivation can result in such a simple implementation – just a few dozen lines of code (though for those with better maths skills than mine, it seems well explained in Karney’s paper). Using Chrome on a middling Core i5 PC, a latitude-longitide / UTM conversion takes around 0.01 – 0.02 milliseconds (hence around 50,000 – 100,000 per second). Note I use Greek letters in variables representing maths symbols conventionally presented as Greek letters (also primes ʹ U+02B9 & ʺ U+02BA): I value the great benefit in legibility over the minor inconvenience in typing (if you encounter any problems, ensure your <head> includes <meta charset="utf-8">, and/or use UTF-8 encoding when saving files).